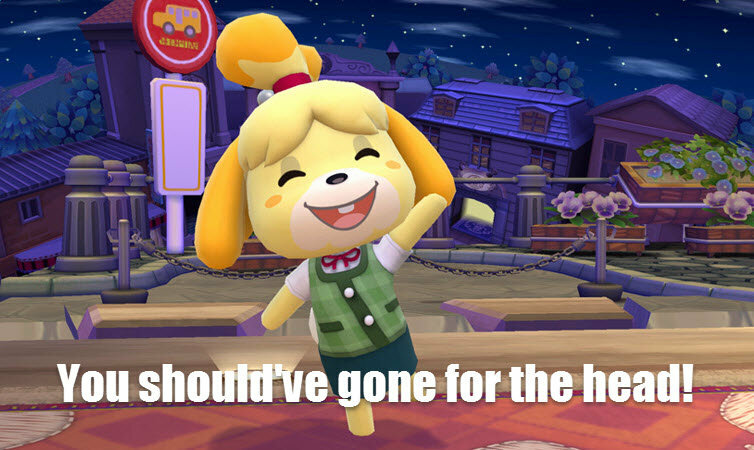 Isabelle is the game's Thanos. Oh and I figured out the Super Smash trigger. I did Mario’s last night which was a treat. In adventure I have been using Kirby because I like his upper special and his downward specials (especially since the air drop takes the form of a variety of items, like spiked balls, Thwomps, and Zelda treasure chests :P). Mario once in a while. I stupidly passed up the chance to unlock Marth, which was very unfortunate - he was my main pretty much non-stop in Melee and I know his move set super well. you’ll be able to come back that pretty quick after going to the molton caves (if you took the northern road). I’m﻿ count﻿ing down until the moment I unlock Simon/Richter to switch. I just unlocked Simon tonight. I defeated him with Bayonetta. I played one match with him on the Luigi’s Mansion stage against Wii Fit Trainer. Seriously, is this game even real? It feels like a fever dream or something. Goddamn that fight against Lemmy Koopa in high winds and no buoyancy. This really might be one of the finest pick up and play games ever conceived. Spirit battles can sometimes be so quick that you’re progressing within sixty seconds. Received this little diddy yesterday. Nice for not only the GC controller but it lets me use the NES Classic or SNES Classic controller on the Switch fit NES games. It also gives me a portable home and screenshot button to work with when playing docked. Current roster - 24/90, significantly less in World of Light. I just found the sub dungeon to unlock the other directions so soon my boy Marth will be back. Also, how great was it having the dungeon blocked by a fight with the Boom Boom spirit from Mario 3? This game has a very sly sense of humour. The Luigi’s Mansion/Fatal Frame mash up level in Adventure mode is ridiclous magnificence. That video was extremely helpful, thanks for posting it. Like ChrisBardon, I just got Super Smash Bros Ultimate and I don't have any previous Super Smash Bros experience so I find myself button-mashing a lot with little idea of what's going on, what I'm supposed to be doing, etc. I agree with this tweet. Piranha Plant is such a goofy choice for a fighter, but it totally works. I love its Up Special, which is like a mixture of Link’s spin attach move and a helicopter. Be sure to grab it if you haven’t already. 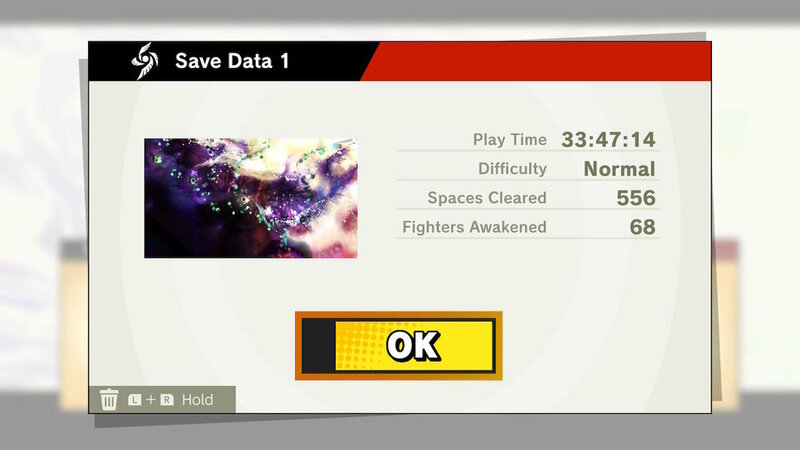 So, I'm a little over 22 hours into "World of Light" now, and I think I'm... about half-way done? I can definitely see why it takes 30 hours or more to finish. It's a huge undertaking with hundreds of individual battles to complete. 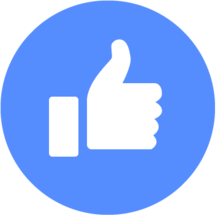 Many of them are fairly easy, and can be completed in one or two tries. Others, though, will have you throwing your controller across the room in frustration. Some of the hardest spirits I've freed so far are Geno (from Super Mario RPG), The Boss (from Metal Gear Solid 3: Snake Eater), and Pauline (from Donkey Kong and Super Mario Odyssey). I still have a bunch of fighters to awaken, and many, many skills to unlock in the skill tree. In addition, I'm also trying to complete Classic Mode with all the fighters—also a big undertaking, given the fact that there are 72 fighters total (the Mii fighters can't be used in Classic Mode). I'll do it eventually. I just need to put the time in to get there. Current status on World of Light. I think I'm on the last map screen now. Finally. I can see the err... light. It's still going to be a long haul to get there though. Love how this game keeps evolving.